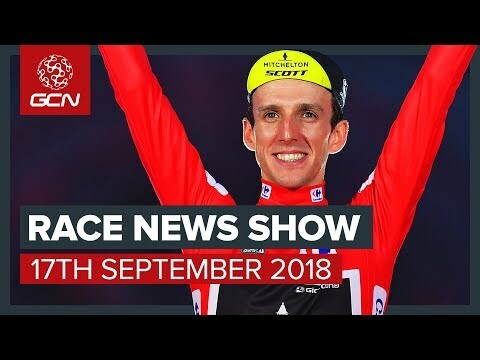 into an almighty success, we ask, just how did Simon Yates win the Vuelta a Espana? and an update from the Race to the Rock. of the Vuelta a Espana. of the Giro d'Italia, a race he dominated from start, almost to finish. So how, exactly, did he do it? attack, taking close to half a minute on most of his rivals. Why was it against the plan? possible moment to take time, and bonus seconds. not lose any time, but not go too deep in trying to gain it. trying to avoid going too deep. thing happened on stage 17, this time to Valverde. he didn't go too deep, didn't dig too far into his reserves. he was persuaded to come. And we didn't see anything from him, until it mattered. Whilst he held back as much as he could, he also couldn't help but attack. There, Pinot won the stage, but Yates won the race. be just as interested in riding hard as he would. Tour win, and Mitchelton Scott have even coined a name for their tactics - conservative flair. but he also had the legs. he didn't have a bad day, and that's what you need to do to win a grand tour. And so, this week's Rider of the week has to be…………Simon Yates. up his 3rd at the Giro with the same placing here, at just 24.
by over three quarters of any hour. race as a professional rider. perfectly to come around Sarah Roy. to become sports director at the newly formed Trek Factory racing. The overall race was won by Ellen Van Dijk. the Tour de France and his subsequent 5 week ban from competition. He easily outsprinted Rein Taaramae at the end of the 200km race. he kicked, nobody could even get close. the 100th edition of the race. for man of the moment Julian Alaphilippe. were turned that afternoon on stage 2.
race lead over Katia Niewiadoma. the race lead in the process. The race will conclude on Tuesday after another two hilly stages. We also, this week, saw a new hour record set in Aguascalientes in Mexico. in pure mathematics which she gained at Oxford University. And now, she's added a world record to her long list of achievements. Sticking with inspiring feats, it's time to head down under for the Race to the Rock. slog along Mulga Park Road against a fierce headwind. finish 2nd between Nick Skarajew, riding a single speed, and Erinn Klein. the mental or physical capacity to do myself. man has ever managed to win it. our GCN Cycling Facebook page. voucher to spend on GCN Merch. There's a link to that on the screen now. in a video you can find down here…….